Your conference room phone is one of your most valuable collaboration assets. But even in smaller or medium-sized conference rooms, calls are productive and efficient when participants can hear clear, crisp voice quality – even during simultaneous conversations. Only Polycom’s Acoustic Clarity Technology delivers the best sound quality with impressive microphone range, ensuring all your conference calls are loud and clear. Polycom brings unprecedented price and performance to voice conferencing and collaboration, making it an affordable productivity tool for more employees and organizations. No wonder that so many people around the world are using Polycom voice solutions to enhance collaboration and gain a competitive advantage, all while reducing costs. From the conference room to executive suites and everything in between, Polycom has the right voice solution to enhance any business communication need. Polycom® has been the worldwide conference phone market leader since 1992. With industry leading acoustic echo cancellation, patented noise cancellation, and easy-to-use configuration software, the Polycom products perform well even in challenging acoustical environments and produce clear, crisp voice quality – even during simultaneous conversations. 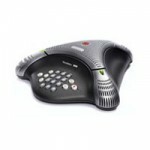 A Wireless DECT conference phone incorporating OmniSound® 2.0. Conference guide, call recording capability and line mode between DECT, mobile and USB for VoIP. Is delivered with a charging cradle and a rechargeable battery. One-year warranty on the battery. The Konftel 300M is a conference phone for mobile networks with 30 hours of talk time, making it perfect for companies with a mobile office solution for which optimum sound quality is required. 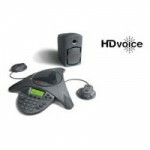 Equipped with OmniSound®2.0, recording, SMS, conference guide and line mode (mobile/USB for VOIP). Can be supplemented with expanded microphones for larger meetings. Delivered with a charging cradle and a rechargeable battery. A SIP based conference phone incorporating OmniSound® 2.0 with wideband. Efficient teleconferences are easily arranged thanks to innovative features such as recording capability, a conference guide and the option of connecting a wireless headset. The Konftel 300IP supports Power over Ethernet. 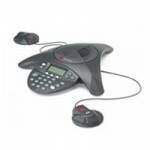 A stand alone conference phone incorporating OmniSound® 2.0. Conference guide, call recording capability and line mode between analogue, mobile and USB for VoIP. Can be upgraded with expansion microphones or wireless headset/PA system for large meetings (optional accessories). Can be upgraded with expansion microphones for large meeting rooms. Ideas discussed over conference are important. Ideas like how to grow your business, streamline operations and boost sales. Collaboration tools like audio-conference phones facilitate communication of ingenious ideas, ensuring your teams are on the same page and keeping you in touch with customers. Your ideas have a mind of their own and definitely are not confined in one place, so why should your conference phone be? 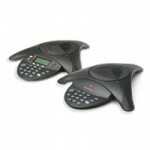 Introducing our range of Wireless audio-conference phones for the 21st century. Conference phones that move as fast as your business, being accessible where you need it, when you need it. Run with it. Do with your conference phone what you do with your ideas.